This report covers conditions and observations made on Monday, February 23, 2015. 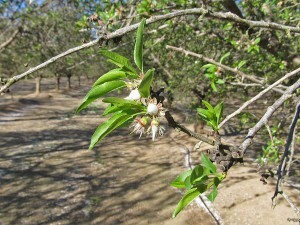 Taken along the west side of the Sacramento Valley, the first two photos in today’s report present the nutlet development in the Sonora and Nonpareil varieties in the Orland area. 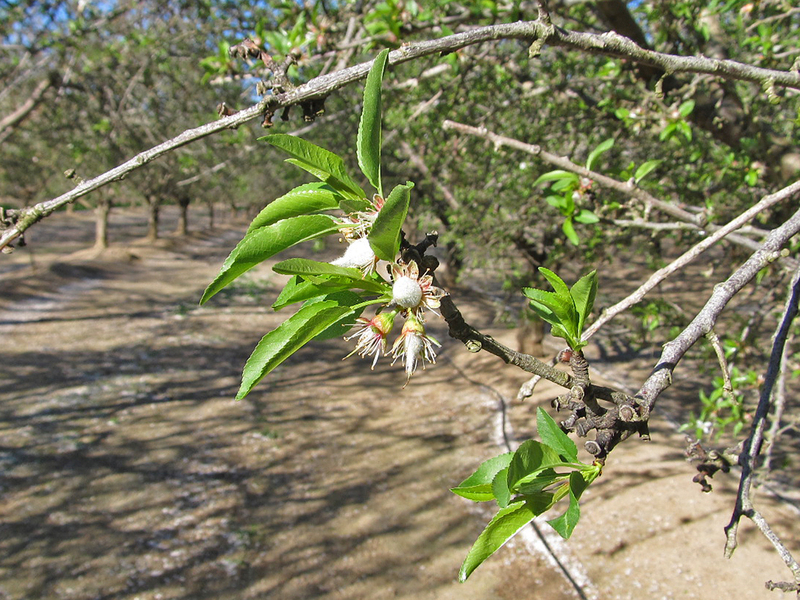 Our third image provides a down-the-row view of a Nonpareil and Carmel orchard in Esparto, with Nonpareil turning increasingly green as its leaves grow in size. High winds ruled the day again in the Sacramento Valley, with sustained speeds averaging between 15 and 20 miles per hour and gusts up to 30 miles per hour. Morning lows around 40 degrees quickly gave way to clear skies and afternoon highs in the mid 60’s. The high winds kept bees close to their colonies and out of the center of orchards. Because of these conditions, bees were only able to put in 2 to 3 hours of poor activity, focusing near the hives. 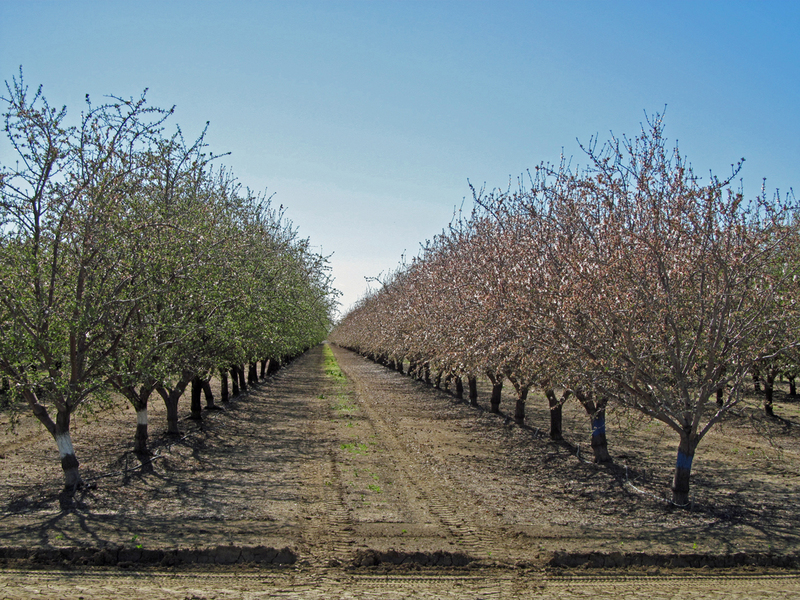 High winds scrubbed petals from the trees throughout the Sacramento Valley on Monday, greatly increasing the proportion of orchards in the petal fall and jacket stages. 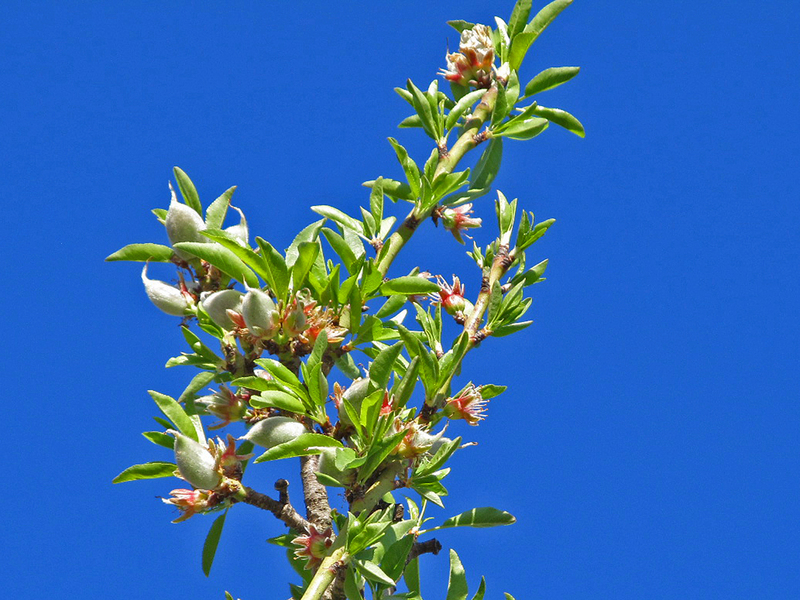 Only Butte and Padre plantings have a significant proportion of their flowers available for pollination, with these late blooming types also rapidly shedding their petals. 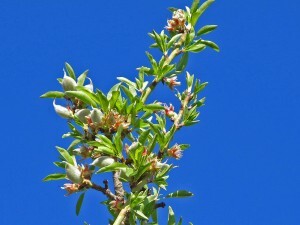 Due to its relatively later start compared to orchards in the Chico/Durham area ,the greatest proportion of flowers available for pollination is found in the southern and western areas of the region. Despite the high winds in the northern region, observers have noted very little tree loss, due largely to the lack of leaf canopy on the trees at this time. The lack of a full canopy allows wind to pass through the branches without much resistance. Wind: 15-20 mph. Gusts up to 30 mph. Bee Activity: 2-3 hours of poor activity.